When it comes to saving money, social media may not be your friend — especially if you're a millennial. Research shows that a whopping 57 percent of millennials spent money they hadn't planned to spend because of what they saw on social media. 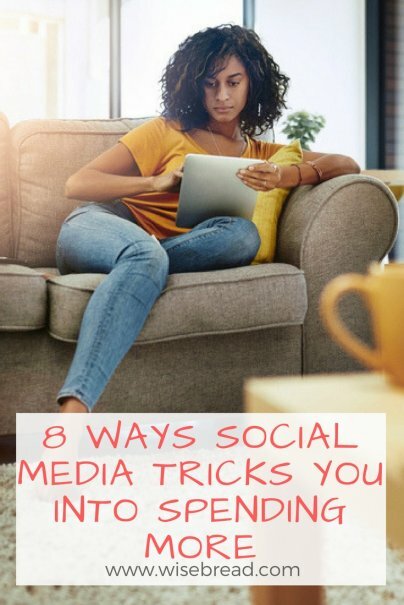 Here are some of the sneaky ways social media gets you to spend more, and what you can do to avoid it. Social media makes it easy for you to hand over your hard-earned (digital) cash with frictionless in-app purchases, like unlocking game levels, adding monthly subscriptions, and shopping for items recommended by people you follow. Within seconds, you can tap or swipe your way into an expensive, unplanned purchase. Social media algorithms may not be helping you in your quest to save money. If you've shown interest in anything from fashion, to coffee, to beauty products, the algorithm on platforms like Instagram remembers what it thinks you like and shows you similar content and products. When you open up the app, the algorithm may then show you a barrage of things you should buy — and they're usually tailored to your preferences, making it doubly hard to resist. If you follow any influencers, your best bet is to unfollow them if you want to keep your hard-earned cash. Seeing someone else's perfectly-curated and styled life is a surefire way to feel unsatisfied with what you currently have, especially if the influencer has (as most do) cultivated an approachable persona. Remember, influencers are not just like us. That entire line of Tom Ford lipsticks, the stylish new watches, and the new clothing line at Nordstrom were probably all provided for free, as was the trip on a private yacht to a beautiful island getaway to show off all their new wares in front of epic scenery. If you start trying to keep up with your favorite influencer's lifestyle, you'll quickly end up in the poorhouse. It's telling that fear of missing out, aka FOMO, has become common parlance on social media. Most of us, to some extent, want to keep up with everyone else. And we fear being left behind, or being seen as not up-to-date. Before the advent of social media, it was hard enough to resist comparing ourselves to our friends, but it's even more difficult now with our drastically expanded circles on social media. The increased frequency of social contact online has also made it harder to resist spending. Whereas before social media, you might've seen that uber-rich high school classmate once a year, now you see what she's doing everyday on Instagram. In fact, 88 percent of millennials believe that social media makes them compare themselves more with others. Not long ago, it seemed like every time I opened Facebook, another friend was hawking leggings, skin care, or essential oils from a multilevel marketing (MLM) company. Wanting to support friends who are trying to make ends meet is an admirable goal, but doing so can quickly add up, especially with the high prices of most of these MLM products. Before long, buying a few products I didn't need had completely wiped out my "fun" money for the month. Sometimes it seems as if the internet is reading your mind. Advertisers on social media are able to target you based on the data you generate by using the platform. Everything including the movie you streamed recently, the ramen shop you checked in at, and your political leanings are accessible in this new marketplace, making it harder to ignore ads that seem custom-made for you. In the interest of preserving your hard-earned cash, take steps to prevent ads from being quite as eerily targeted toward your likes. Clicking on the small triangular "AdChoices" logo on any online ads served to you will take you to a page run by an organization called the Digital Advertising Alliance. Once you get to the AdChoices page, you can opt out of having ad networks target you with personalized information. It won't block ads entirely, but it will help you avoid the onslaught of personalized ads. It may seem old-fashioned, but it's nice to take a break from social media sometimes if you feel you're too caught up in the constant marketing ploys. Research shows that spending a lot of time on social media can have negative effects on your mental health. Try consciously unplugging over the weekend and spending that time with friends in-person, or limiting yourself to an hour a day of social media time throughout the week.